BC Ferries’ CEO David Hahn points the finger at lousy weather and a strong Canadian dollar. He claims that more Americans are choosing to stay Stateside while Canadians are heading south the spend their dollars. Hahn further states that he does not believe rising ferry fares play any part in BC Ferries’ financial loss this summer. 1. Vancouver Island is stunningly beautiful, rain or shine. Rain has never stopped tourists from kayaking, surfing, hiking, wining and dining. 2. Of course there’s the temptation to spend the almighty Canadian dollar at Target, but that’s shopping – not tourism. BC residents will still take holidays. 3. 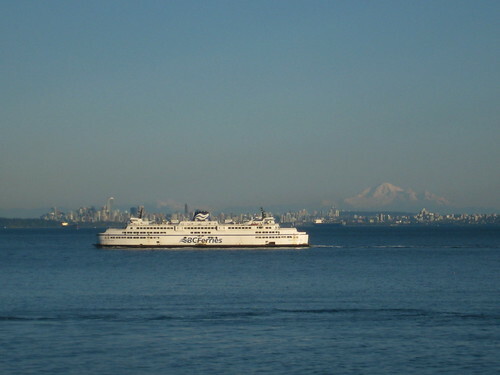 In blaming a weak U.S. dollar, one could draw the conclusion that Hahn is implying that BC Ferries normally heavily relies on its traffic from American tourists rather than locals. That doesn’t add up. I, for one, take the ferries far less than I used to. Sound Off: What are your thoughts? Do you think the strong loonie and rainy days are to blame? Or are people avoiding the ferries because of steep increases in fares? Vancouver Island is simply stunning rain or shine. The raising price is making people think twice about heading to the island. I know I did. Back in June a group of 4 and a car cost us over $100 one way. At over $200 return for a family of 4 that’s not an affordable weekend get-a-way whichever way you put it. The rates are too high … and I don’t think BC Ferries is getting value for their dollars they’re paying to their management. My opinion of the organization has really soured since I moved here three years ago … and that’s a shame because my negative impression of BC Ferries is keeping me on the mainland and from exploring more of the beautiful getaways that this province has to offer. I would say the high-cost of taking the ferry deters people! It surely deters us! It’s almost $200 for a round trip!! That’s insane considering it’s an extension of the highway system. Isn’t it free to use the ferries on the mainland if it’s an extension? We love the island, and would spend more time there if it wasn’t expensive to get to/from. BC Ferries is crazy and poorly run. Allan and I used to go over to the island 10, maybe 12 weekends a year. Now we cut it down to 2 or 3, SOLELY because of the cost of the ferry. Yes, more people would go over more frequently if it was cheaper. You know what? I would even be OK with keeping the ferry the same price on the long weekends, and then decreasing it by 25% for other weekends or week days. We would go over to the island more frequently on normal weekends instead of only going over on long weekends if it was cheaper. Oh yeah, and maybe they should consider WHY exactly they need to advertise on newspapers, radio, and in Rogers Arena when they are packed out every weekend in the summer.